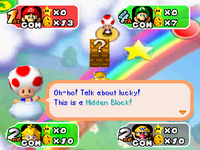 A Hidden Block is an invisible block that contains coins, a Star or random items in the Mario Party series, appearing in every installment up to Mario Party 5, and in Mario Party DS and Super Mario Party. Its appearance changes with each game, sometimes resembling Brick Blocks, other times looking more like a small Treasure Chest. They only appear after landing on a Blue Space in all of its appearances except Mario Party, where it can also appear after landing on a Red Space. It can give out anywhere from five to twenty coins or give out items such as Skeleton Keys, or even Stars. In Mario Party 5, Hidden Blocks will always give ten coins. In Mario Party, Hidden Blocks are known as Event Blocks. In Mario Party DS, in addition to coins and Stars, a Hidden Block may also contain a Ztar, which causes the player who hit it to lose a Star. The game also features a one-time use item called a Block Sensor that makes a Hidden Block appear on the space the player lands on after using it. In Super Mario Party, in addition to finding them on Blue Spaces, the player can also use a Hidden Block Card to summon one instantly. It's possible for the player to find out if the Hidden Block in Mario Party DS contains a Star (or Ztar) or coins. If the block appears right when the player lands on the space, the block holds coins. If the block appears later, it contains a Star or Ztar. Another way of finding out is to watch the camera. The block will contain a Star or Ztar if the camera zooms in before the game tells the player to tap/press A repeatedly. If the camera doesn't zoom in quickly, the block most likely contains coins. The hidden blocks may also contain items, but it happens rarely. This page was last edited on December 24, 2018, at 09:42.